We present the first real-time human performance capture approach that reconstructs dense, space-time coherent deforming geometry of entire humans in general everyday clothing from just a single RGB video.We propose a novel two-stage analysis-by-synthesis optimization whose formulation and implementation are designed for high performance. 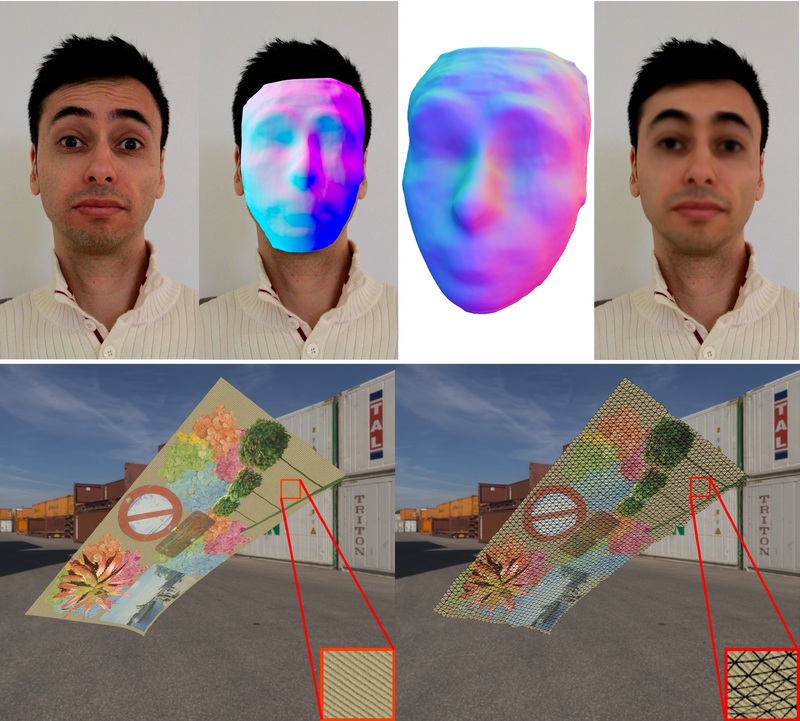 In the first stage, a skinned template model is jointly fitted to background subtracted input video, 2D and 3D skeleton joint positions found using a deep neural network, and a set of sparse facial landmark detections. In the second stage, dense non-rigid 3D deformations of skin and even loose apparel are captured based on a novel real-time capable algorithm for non-rigid tracking using dense photometric and silhouette constraints. Our novel energy formulation leverages automatically identified material regions on the template to model the differing non-rigid deformation behavior of skin and apparel. The two resulting nonlinear optimization problems per-frame are solved with specially-tailored data-parallel Gauss-Newton solvers. In order to achieve real-time performance of over 25Hz, we design a pipelined parallel architecture using the CPU and two commodity GPUs. Our method is the first real-time monocular approach for full-body performance capture. 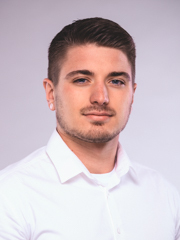 Our method yields comparable accuracy with off-line performance capture techniques, while being orders of magnitude faster. 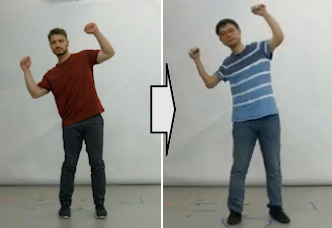 We propose a method for generating (near) video-realistic animations of real humans under user control. In contrast to conventional human character rendering, we do not require the availability of a production-quality photo-realistic 3D model of the human, but instead rely on a video sequence in conjunction with a (medium-quality) controllable 3D template model of the person. With that, our approach significantly reduces production cost compared to conventional rendering approaches based on production-quality 3D models, and can also be used to realistically edit existing videos. Technically, this is achieved by training a neural network that translates simple synthetic images of a human character into realistic imagery. 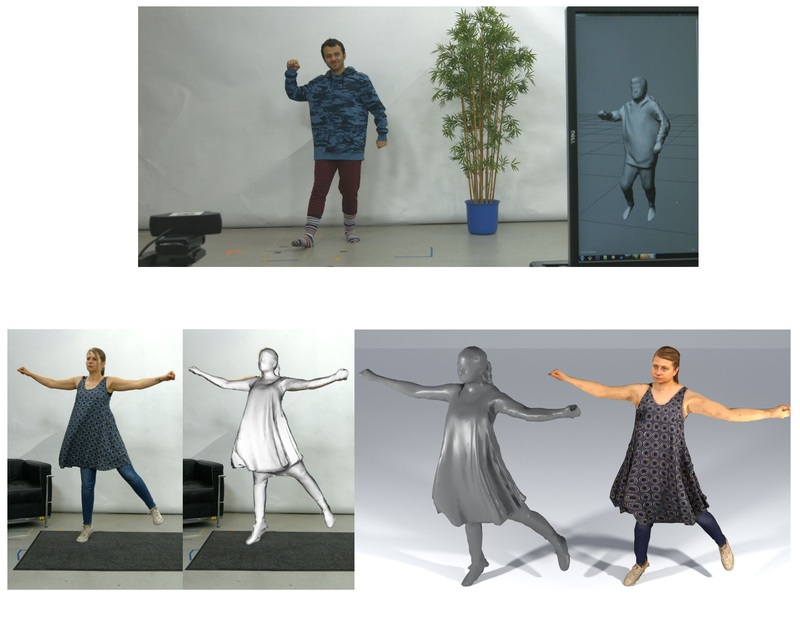 For training our networks, we first track the 3D motion of the person in the video using the template model, and subsequently generate a synthetically rendered version of the video. These images are then used to train a conditional generative adversarial network that translates synthetic images of the 3D model into realistic imagery of the human. We evaluate our method for the reenactment of another person that is tracked in order to obtain the motion data, and show video results generated from artist-designed skeleton motion. Our results outperform the state-of-the-art in learning-based human image synthesis. We propose an efficient method for non-rigid surface tracking from monocular RGB videos. Given a video and a template mesh, our algorithm sequentially registers the template non-rigidly to each frame.We formulate the per-frame registration as an optimization problem that includes a novel texture term specifically tailored towards tracking objects with uniform texture but fine-scale structure, such as the regular micro-structural patterns of fabric. Our texture term exploits the orientation information in the micro-structures of the objects, e.g., the yarn patterns of fabrics. This enables us to accurately track uniformly colored materials that have these high frequency micro-structures, for which traditional photometric terms are usually less effective. The results demonstrate the effectiveness of our method on both general textured non-rigid objects and monochromatic fabrics.